If you're celebrating St. Patrick's Day, your luck will run out if you drive while under the influence of alcohol or drugs. Watch for increased impaired driving patrols by Sheriff's Deputies across San Diego County on Sunday, March 17th starting at 6:00 p.m. and lasting through 6:00 a.m. the following day. 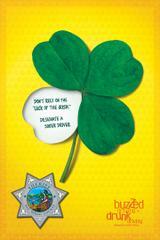 Ahead of St. Patrick's Day, there will be DUI checkpoints in Encinitas and Santee on Friday, March 15th. People who drive under the influence of alcohol or drugs, including marijuana and prescription drugs, put everyone's lives in danger. According to the California Highway Patrol (CHP), one person was killed and 48 others were injured in DUI crashes on St. Patrick's Day in 2018. If you are caught driving while impaired, you will go to jail. During St. Patrick's Day 2018, Sheriff's Deputies arrested five people on suspicion of impaired driving. That's down from 12 arrests on St. Patrick's Day 2017. The Sheriff's Department arrested a total of 1,183 people for driving under the influence of alcohol or drugs in 2018. That's down from 1,225 arrests in 2017. "The Sheriff's Department has a zero tolerance policy on impaired driving," said Sheriff Bill Gore. "If you drink, have a designated driver ready or use a ride-sharing service. BUZZED DRIVING IS DRUNK DRIVING." Watch our public safety message on the high price of drinking and driving by following the Sheriff's Department on VIMEO: https://goo.gl/9Ah3Mx. Funding for the St. Patrick's Day DUI enforcement program was provided by a grant from the California Office of Traffic Safety (OTS) through the National Highway Traffic Safety Administration (NHTSA).